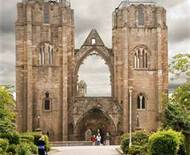 Elgin Cathedral is sometimes referred to as the “Lantern of the North” and is now a historic ruin in Elgin, Moray, Scotland. There once was a massive wall that surrounded the precincts of the cathedral of which only a small portion now remains. Initial construction was started in 1224 and the original building was smaller than the floor plan now seen in the ruins. The west front towers originally had spires. 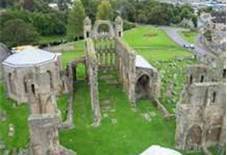 Of the present ruins, only part of the north wall and the south transept’s southern wall dates from this time. There was a fire in 1270 that did extensive damage to the building. A program was begun to repair and greatly enlarge the cathedral. An English style octagonal chapter house was built during these renovations. During the Wars of Independence the cathedral remained for the most part undamaged until it was burned in an attack in 1390 by the brother of King Robert III. After the fire the main tower and the western gable between the towers as well as the main west doorway and chapter house had to be rebuilt. 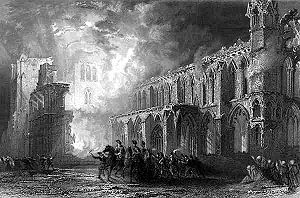 The building was attacked and burned again in 1402. The remodeling after this fire included a large pointed arch with a series of windows. The uppermost window is a rose window that dates from 1422-1435. After the Reformation, ownership of the property was in the hands of the Crown. In 1560, parliament legislated that Scottish churches would be Protestant and Catholic mass was illegal. Cathedrals only survived at this time if they were used as parish churches. 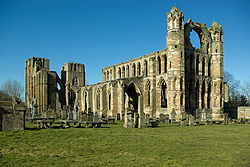 Elgin was already served by a parish church so the cathedral was abandoned. In 1595, King James VI gave ownership of the grounds to the burgh of Elgin to be used for educational purposes and to help the poor. By act of Parliament in 1567, the lead was removed from the roof of the cathedral to be used for the army. The ruins were in a great stage of decay in 1637 when the roof of the eastern limb collapsed in a gale. The destruction of the great west window may have been caused by the troops of Oliver Cromwell during the Protectorate between 1650 and 1660. The grounds of the cathedral began to be used for burials. The central tower collapsed in 1711 destroying the nave and the stone began to be quarried for other buildings. Repair and restoration work has continued on the ruins from the 19th Century onwards.